New Braunfels Street Bridge San Antonio Texas. Photo 1. 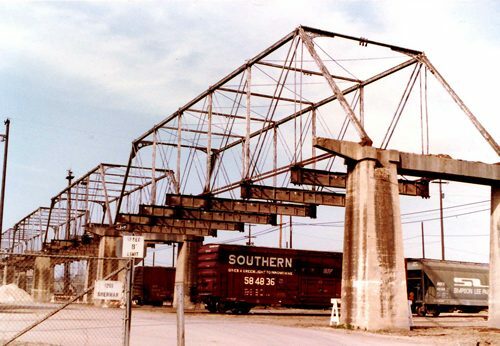 For as long as I could remember while growing up on San Antonio’s eastside and until the summer of 1981 this old New Braunfels Avenue bridge stood over the large Southern Pacific railroad East Yard. It was replaced by a modern concrete structure that carries twice as much vehicular traffic as the old Phoenix Bridge did but has little architectural character. This photo was shot just after the old bridge’s roadbed had been removed so offers a good look at the historic wrought iron Phoenix Bridge. Originally this bridge was part of a longer span built in 1887 that crossed the Atchafalaya Basin near Morgan City, Louisiana. In 1910 it was disassembled there then re-erected on new Braunfels Ave. by the S. P. Railway Co. because they planned to add many more tracks to their expanding San Antonio East Yard and Shops. Photo 2. This second view offers a closer look at the concrete footings and Erector Set type construction of the bridge built by the Phoenix Iron Works near Philadelphia, Penn. 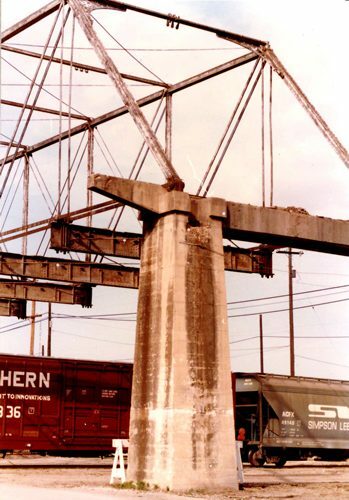 The bridge was held together by huge bolts and nuts so could be taken apart whenever necessary. Urban legend had it that the bridge was shipped to somewhere in South America then put together a third time. We cannot document this but what is fact is that it’s twin span still sits several blocks away on Hays Street and also sits over the S. P. tracks. That bridge is being restored exclusively for foot traffic as part of an urban renewal park project. A good look at the New Braunfels St. bridge can be had by renting martial arts wizard Jackie Chan’s first American made movie titled The Big Brawl aka Battle Creek Brawl(1980). Set in 1930s Chicago’s, it was actually filmed in San Antonio of all places. An early scene features Jackie gymnastically swinging across the bridge superstructure while his American girlfriend follows along underneath him in an open top roadster. For old-time San Antonians there is also a fight scene that was filmed at the Sunken Gardens Theater otherwise the city is mostly unrecognizable behind the movie action.